Trai has got more efficient in past couple of months – 10 days after they released the August 2013 Telecom subscription report, they have now published telecom subscriber report for month of September 2013 as well. The highlight for month of September was Reliance losing 10 million subscribers to deactivations and thus dropping their market share by over 1 percent from 14.46 percent in August to 13.35 percent in month of Sept 2013. On the other hand, Idea gained highest number of subscribers to the tune of over 1.2 million increasing their market share from 14.37 percent to 14.61 percent and becoming the 3rd largest operator in India. After 4 months of positive growth, the total mobile subscriber numbers fell in September 2013, largely due to Reliance’s 10.5 mln subscriber cull. The good part though is that, those numbers were mostly unused numbers that went out of system due to deactivations. The number that needs to be closely watched is the active subscriber base, and on that front the numbers are doing quite well. Infact, even if there has been drop in overall numbers, the active subscriber base has actually increased. In month of August 2013, active subscriber base increased by 4.48 million, while in month of September, despite 10 million subscribers going out of the system, 3.01 million new active subscribers were registered. India now has 738.89 million active subscribers and the active subscriber percentage has risen to 84.87. The chart below exactly shows how the active subscriber base is growing over pas 18 months. – With an decrease of 6.14 million in Sep 2013, total mobile subscriber base has reached to 870.58 million. 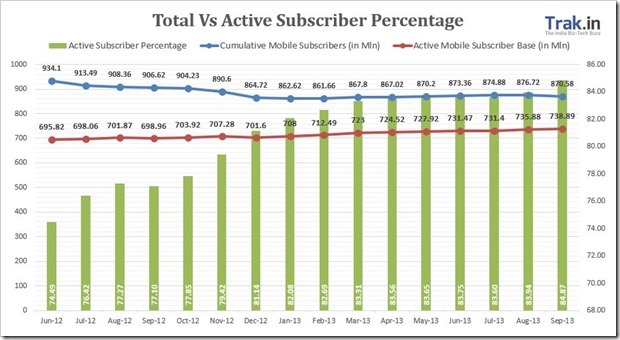 India had 876.72 million subscribers by end of August 2013. – Urban India witnessed a decrease of 1.07 percent or 5.63 mln subscribers, while rural mobile subscriber base decreased by 0.15 percent or 0.51 mln. – Urban Teledensity decreased to 137.93 from 139.65 in Aug, while the rural tele-density decreased to 40.96 from previous 41.05. – Urban mobile subscriber share stands at 59.75% as compared 40.25% of rural subscribers. – 2.29 million new Mobile portability requests were made in month of Sept 2013, taking the total tally of MNP requests since launch to 102.49 mln. – Active Mobile Subscriber base increased from 735.88 mln in Aug 2013 to 738.89 mln in Sept 2013 taking the active percentage to 84.87 percent. – Broadband Subscription increased to 15.36 mln from previous tally of 15.28 mln. – Wireline Subscriber base fell to 29.28 mln in Sept 2013 as compared to previously 29.46 million. – India’s total telecom subscriber base (wireless+wireline) has decreased to 899.86 mln in Sept 2013, compared to 906.18 mln in Aug 2013. With nearly 10.5 million Reliance subscribers de-activated, they now have a today market share of 13.35 percent and have fallen to 4th place. 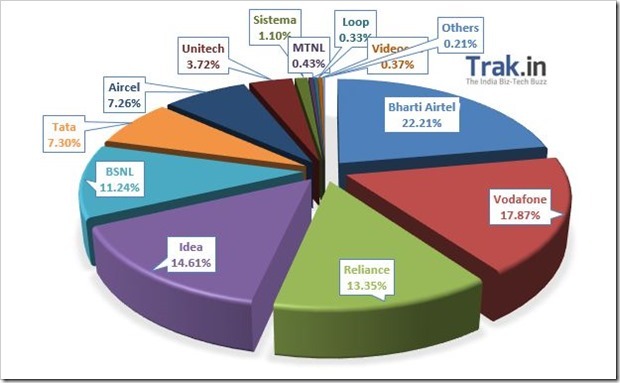 Bharti has consolidated its market share further to 22.21 percent followed by Vodafone (17.87%) and Idea who now have 14.61 percent market share in India. Aircel (7.3%) has been consistently doing well in past 1 year and now are closing in on Tata (7.26%) to become 5th largest operator in India.